TER: What's an example of a less risky asset? MW: Two companies that are starting to see a solid de-risking to their asset base are the two that I'm most bullish on in 2013: Lynden Energy Corp. (LVL:TSX.V), which is operating in the Cline and Wolfcamp shales of West Texas, and Americas Petrogas Inc. (BOE:TSX.V) in Argentina. Lynden is listed on the Toronto Venture Exchange, based in Vancouver, and exploring in Texas, which has kept the story relatively unknown to many investors despite its strong performance in 2012. Lynden has exposure to more than 100,000 gross acres in the Wolfcamp and Cline shale formation in the Midland Basin of West Texas. We expect the company to report a 2012 exit production rate of about 1,000 barrels of oil equivalent per day (1,000 boe/d) from 7,000 net acres in the middle of the Wolfcamp basin. This land package and production underpins its current valuation of $100 million ($100M) as it recently sold 660 net acres for $25M. 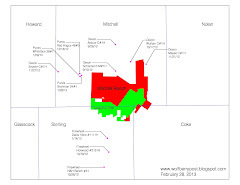 What's more exciting here is that the company holds 50% of 68,000 gross acres in Mitchell County. This property is in the middle of Devon Energy Corp.'s (DVN:NYSE) 560,000-acre Cline shale package, which is only beginning to be explored. Following the money, Sumitomo Metal Mining Co. Ltd. (STMNF:OTCPK) recently paid Devon $340M in cash and is committed to spend more than $1 billion ($1B) for just 30% of the ground in the basin. The majority of that is going to this Cline package, which Lynden's ground is right in the middle of. Just south of this area, Sinochem International Corp. just paid Pioneer Natural Resources Co. (PXD:NYSE) $500M in cash and is spending $1.2B to drill 86 horizontal wells in the Wolfcamp. This is adding fuel to the fire in what is turning out to be one of the more exciting American domestic oil plays. Lynden's plan for the year is to continue to push its Wolfcamp production and probably drill a well on its Mitchell property to prove the Cline shale extends through its ground. TER: What was Lynden's production last year and what's its production guidance for this year? MW: Lynden came into 2012 producing 300–400 boe/d and its guidance throughout the year was to exit 2012 with 1,000 boe/d. Lynden will be reporting soon and we expect its exit production to be in line with its guidance. TER: What's the plan to expand that production in 2013? MW: These are not very expensive wells, so Lynden will continue to rely on its $30M borrowing base to expand production as it has been doing for the last year. TER: It sold roughly $25M worth of acreage. What are the plans for that cash? MW: That cash brought down the borrowing base to essentially zero to allow the company to continue pushing forward on its production expansion.